A lot of this site deals with converting modest size commercial panel vans into camper vans, RV’s, and toy haulers. This page puts some details to the advantages of taking this approach. Easier parking (at home and on the road). The ability to have just the layout and equipment you want — even for multiple purposes. This section puts some numbers and details to these benefits. While a lot of the content here is about people who build their own conversion vans, it is also entirely feasible to plan out your ideal layout, and have a commercial conversion outfit do it. 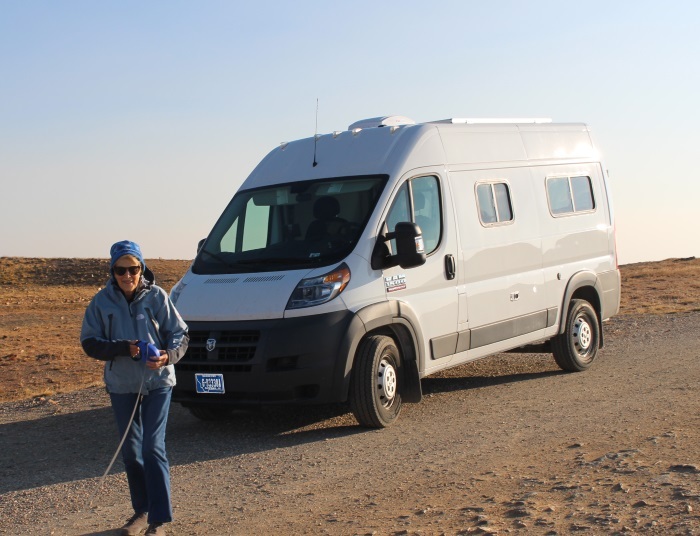 This can even be pretty cost effective in that you may decide you don’t need things like the marble counter tops and noisy generators that inflate the cost of many commercial RV’s. 10 What Does Fuel Efficiency Depend On? 12 Comments, Questions, Suggestions, Ideas? This table puts some numbers to the cost, fuel efficiency, and emissions differences between various styles of RV’s. Tried to pick RV’s from each class that were in the middle and up-to-date. If you look around online, the mpg numbers for a given RV tend to be all over the map, so I tried to find examples where actual RV owners had kept careful track of mileage over a long period of time. The Class A fuel numbers are this report on the for the Fleetwood Bounder. The Conversion Van fuel numbers are from our ProMaster conversion. The Small Camper fuel numbers are based on the EPA highway estimate of 30 mpg minus a bit for the high payload and the not quite as aerodynamic “pop top” as the standard roof. To keep things simple, I used all gasoline powered vehicles. I know that diesels are more efficient and get better mpg. A part of the better mpg (about half) is due to the fact that a gallon of diesel has 13% more energy content than a gallon of gasoline (129.5K BTU vs 114.5K BTU), and a part is due to the greater efficiency of the diesel cycle vs the auto cycle. The larger energy content per gallon of diesel also makes for proportionally greater CO2 emissions (19.64 lbs CO2/gal for gasoline, 22.38 lbs CO2/gal for diesel), so diesels do not help as much on emissions as they do on fuel use. You could do the table using all diesel versions and the relationships would be about the same. Its interesting to note that the Class B Travato and our van conversion share the same RAM ProMaster base vehicle. So, frontal area, power plant, … are the same. The Travato is 17% longer and 25% heavier than our conversion, and the fuel efficiency of our conversion is 29% better than the Travato – this is a little more than I would expect, and there may be some difference in driving speed and style, but it does tend to show what you can accomplish with some minimization and attention to weight. The table shows the initial costs. There is a significant initial cost saving in dropping down in RV size, and an even more significant cost saving in doing your own conversion. It is possible to save over $100K, and you may also end up with a camper that better meets your needs. The table gives an idea of the improvement in fuel economy you get as you go down in size — from 7 mpg for the 34 ft class A up to 20 mpg for our DIY van conversion, and 28 mpg for the small camper. Over the life of the vehicle this is can be a $60,000+ saving just in fuel! Other operating costs are also going to be less for the smaller van conversion vehicles. The CO2 emissions are directly dependent on how much fuel you burn — every gallon of gas is 19.64 lbs of CO2 into the atmosphere. From lifetime emissions of over 200 tons for the Class A to 74 tons for our DIY Van Conversion and an even lower 49 tons for the small van camper. The Van Conversion example uses the RAM ProMaster 136 inch wheel base model as the base van. Its 18 ft long, which is about the same as medium size SUV and shorter than many pickups. It fits in well in the infrastructure made for cars (at least in the US). It parks in regular parking spots (parallel or pull in). Does u-turns in regular streets. Goes around corners easily. You can pretty much drive it just like a car. Just don’t try to pull into parking garages with low roofs designed for cars — that would would leave a mark. The u-turn circle (curb to curb) for the Van Conversion is 40 ft, while its about 60 ft for the 34 ft Class A. For comparison, a Honda Pilot (medium SUV) is 40 ft. So, the van conversion can do u-turns on most streets (just like a car). If you are on the road and coming into a town you would like to stop at and look around, you don’t have to think “where am I going to park my big ‘ol motorhome”, you can just go for a regular parking spot. It will also fit into tight camp grounds and tight camp spots easily. The Class B example is 21 ft long, so a bit more of a challenge on the road system, but still able to do pretty well. The Van Conversion type campers do well on most back roads. They generally have good ground clearance, maneuver well, and are not too wide. Sort of like driving a 2WD pickup truck on back roads. Not for heavy duty jeep trails, but fine for most back roads. If you like to do this kind of driving (as we do), its no problem — just be sure that the conversion is done in such a way that things in the back are secured in place. Its good to retain the full size spare for this kind of driving — even if you have to mount it on the back door to make more room underneath for tanks. Doing a van conversion yourself gives you the freedom to choose any layout you want and to design it carry whatever you want to carry. All you have to do is look at some of the builds on the ProMaster, Transit, and Sprinter forums to get an idea how many different kinds of uses these vans have been converted to. If you want something that can be an RV, but can also haul bicycles, show dogs, motorcycles, wind surfing stuff, … you name it — then a converted van might be the way to go. It is also entirely feasible to plan out your ideal layout, and have a commercial conversion outfit do it. This can even be pretty cost effective in that you may decide you don’t need things like marble counter tops or noisy generators that inflate the cost of many commercial RV’s. If you want to look into this approach, I’d start by taking a look at the SportsMobile site — there are many outfits out there that do conversions, but the Sportsmobile site lays out the options well. An example: Steves’s custom converted van on the PM forum. The Van Conversion size camper makes a pretty acceptable 2nd car that can be used for picking up some sheets of plywood, the kids, or even commuting to work. You can even plan the conversion to make it easy to use the van as both a camper van and a general purpose hauler of big bulky stuff. The obvious thing that you give up in going from a large class A style RV to a converted van style RV is living space. A moderate size class A might have about 200 sq ft while mid sized converted van is more like 100 sqft, and a small converted van might be more like 60 sqft. So, it tends to come down to can I live comfortably in this smaller space in order to gain all the other advantages? Clearly many people have decided that they can, but its a decision you and your family have to make. I’d suggest spending a lot of time looking at actual RV’s and trying to carefully visualize life on a smaller scale — you may find that you really like small. What Does Fuel Efficiency Depend On? We totally agree. Converting our own van felt to be the right choice from day 1. It requires a lot of work, time and energy but the result worth it. We bought a Mercedes Sprinter and it took us 3 months to convert it. Next time, we will probably go for a 4×4! Read through the trip report. Very nice! I’m being sold more and more on a PM due to the cost of the sprinter (new at least). I was curious what you thought about diesel vs regular gas? As you can probably guess from the name of my site, I’m a bit of a tree-hugger and for me the important thing is would the diesel version result in lower carbon emissions. The answer seems to be yes it it would. Diesel fuel contains about 10% more carbon than gasoline per gallon, but the diesel PM appears to get about 25% better MPG, so there would be a net gain in efficiency and a lowering of carbon emissions. If you look at the ProMaster Forum, there are long and ongoing debates on gas vs diesel. RDinNHandAZ is a big diesel fan, and probably makes the best overall case for it. In my particular case, my supreme commander dislikes diesels a lot, and adding this to the already somewhat controversial decision on doing the van conversion project at all was not int he cards. Also think that the diesel was not readily avialable when we bought. Making things more complicated, they have stopped making diesel PMs for now. This (I guess) has something to do with the federal law suit against FCA on some of their diesel offerings. No word yet from FCA whether they will resume diesel production or when. The automatically shifted manual transmission that is used on the PM is also a bit controversial — some think its great, others not so much. I would definitely drive one of these before you make the decision. Love your site! It’s been soooo informative. I’m in negotiations with the supreme commander (i.e. wife 🙂 ) for going down this path, and I really like your review on the PM! Can you tell us how it’s going now that it’s about a year from the last post on the PM in terms of how you like it, maintenance, how many miles you have now, etc? We live up in Seattle area, and I really am leaning more towards the PM with FWD vs the SPrinter (for many reasons you’ve mentioned). The one thing I like about the sprinter is you can get a 4WD option now, but I shy at the maintenance costs (long term). We are liking the PM just fine. We just got back from a 7300 mile trip up to the Yukon and Alaska, and I put up a trip report about it. It has some material on how the PM performed (basically flawlessly). I honestly can’t say a lot about how it compares to the Transit and the Sprinter as I’ve not owned either one of them, but can say that we like it. I’m kind of opinionated on on 4WD. I don’t think its generally worth what you pay in initial price, worse fuel mileage, and added maintenance. This opinion dates back a long ways to when 4WD vehicles were just coming out for regular consumers. At that time we were still doing a lot of climbing in the Washington Cascades, and most of these climbs involved an approach on poor to very poor roads. Was thinking about getting a 4WD because of this, but my observation was that when the typical approach road started getting bad enough that a 2WD would not make it, that it was not very far at all before it gotbad enough that a 4WD would not make it either. This may be something kind of unique to the Cascades. The basic 2WD PM is pretty good on back roads and has descent ground clearance and traction — just my 2 cents, but I don’t think 4WD would gain you much unless you are into the sport of doing 4WD trails. I’ve been working on my DIY conversion now for almost 2 years, it sits in my garage and as soon as I have a couple of hours to spare I’m in there, it’s a fun project, I’ve never done this before so it’s not going at a very fast pace, I never owned a camper either so I have to learn about everything before I can make a smart decision, and I need to be 150% sure before cutting in those side panels or pulling the trigger on some expensive equipment. I just wanted to share with you guys, how and why I chose a 2010 Ford extended E250 with high top 5.4L V8 (from Florida, very clean). 3 years ago (2014) when I started thinking about doing this there was 3 options, Ford van, GM van or a Sprinter. My first choice was a diesel Sprinter, I had a 16 to 20k budget so I was looking for a used vehicle. That confirmed that I was going with Ford E series van, if I break anything, a window, axle or transmission I can find a cheap priced part on the same day and they’ve bee around for ages. I’m not sure what the MPG will be once I’m done building it. Thanks for the info — please keep us posted on how it goes. In my search for a van, I started out the same way with intention of buying a sprinter. The money difference really got to me ($45,000 vs. $30,000) and having had a Mercedes sedan previously, the repair costs and upkeep are very expensive. I like the Ford Transit for its ease of driving as it’s more like a passenger car than the Promaster. And, great layout in the cab area. However, it’s more expensive than the Promaster by $3000-5000 for same type of vehicle. It’s great that Ford has so many dealerships but our Ford Class C RV needed a new transmission at 100,000 miles. Too many Fords hit the dust before the 100,000 mile mark. At first I shied away from the Promaster. After a trip to Italy I saw them everywhere (Fiat), being used for the Postoffice and as ambulances, and of course, for campers. Now the US Post Office uses them for many of their mail delivery vans. Having driven the Promaster 2500 (136 inch WB, high top) for six months now, I am amazed at the turning radius, large front viewing screen, and overall spacious interior. Love the front wheel drive. It’s a fun vehicle to drive once you get the hang of it. Now I like it better than my Honda sedan. I am getting about 18 mpg (gas) with a max of 22 mpg on a long range trip. It’s not really broken in yet with 4000 miles, so hopefully it will average about 20 mpg. My wonderful Class C, fully loaded with kayaks on top and bikes on back averaged about 8 mpg (gas). I should be finished with the van conversion in another two months, but so far glad that I chose the Promaster. Only real complaint is the lack of dealerships as compared to the Ford (in Oregon). Both are good vehicles in my opinion. Good luck on the conversion — please let us know how it comes out. I’m oscillating between models and would love to know about your thinking behind your ultimate choice. I actually started out looking for a used Sprinter, but had a hard time finding anything with not too many miles at a reasonable cost. In the mean time I kept up on the Sprinter Forum (a great source for Sprinter and van conversion info), and I did get a bit turned off on the high cost of maintenance and repairs that were being reported. So, I started looking at the ProMaster and pretty much liked what I saw in terms of the envelope, front wheel drive, and lower initial cost than the Sprinter. I did not really want to buy a new van as RV’s typically don’t accumulate a lot of miles and a used van with some miles on it seemed to make more sense. But, in the end, bit the bullet and got a new PM. We have been happy with it, and only maintenance so far has been routine oil changes at the dealer which are reasonable in price. The Ford van was still a couple months from coming out when I bought mine, so did not really consider it. Its clear from reading the Forums for each of the three vans that people can do good conversions, and that each has van brand has its loyal following. I just found a Dodge Promaster City Van fora good price with really low miles – but to convert it I will need to add a “pop top” so I can stand inside. Any feedback on average price for having this done – and any chance I can have Solar Panels mounted on the top without risking pinched wires on the raise and lower? I’m a real newbie – can I safely mount solar batteries inside the passenger space, like under the couch or bed? I think you could work out a way to route the wires up to the PV panels OK. I guess you would first need to make sure that you can get a pop top for the City — have not seen any myself, but they probably exist. You might look for people who make tops for the Ford Connect as there are more of them out there. Don’t know about the prices of the pop-tops. You might try asking the question on the ProMaster forum (which also covers the City) — I’ve seen stuff on pop-tops there for ProMasters, and there might also be something on City pop-tops, or someone who knows something about them? Please keep us posted on your conversion — I’d love to get some pictures and story on a City conversion. Seems like a really efficient way to go. Spent some time last week in the San Francisco downtown area where parking is at a premium to say the least. With our van conversion RV (shorter than a lot of pickups) we were able to find regular street parking places without a lot of trouble. This was a real plus compared to a full sized RV.